Receive 8-pc gifts upon purchase of RM350 & above. Top up your purchase to RM600 & more, you'll receive an additional cabin-sized Polka Dots Luggage Bag! LANEIGE's Water Bank Starter Pack! Start your moisturizing skincare routine with LANEIGE. 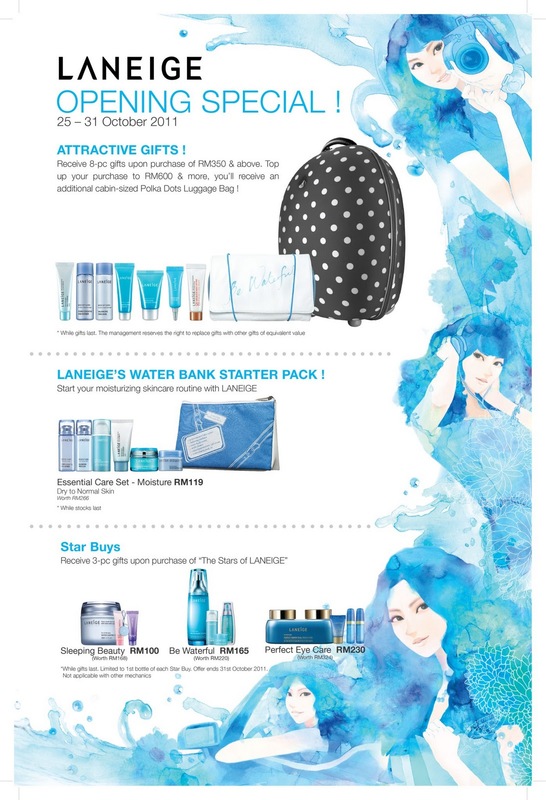 Receive 3-pc gifts upon purchase of "The Stars of LANEIGE"
* while gifts last. Limited to 1st bottle of each Star Buy. Offer ends 31st October 2011. Not applicable with other mechanics.